Many might wonder what sets The Seychelles apart from its neighbours. The answer is pretty simple, and it has largely to do with the way the islands are promoted. Unlike other island destinations which have becoming hip with party-goers, The Seychelles is the perfect destination for tourists who want nothing more than peace and quiet. Honeymoon couples, meet the paradise you’ve been looking for. Island hopping is also a popular choice among tourists... why not piece together your own customized island hopping experience and take in everything The Seychelles has to offer? The fact that you can travel to The Seychelles at any time of the year also helps, because there are a wide variety of activities to offer, such as: hiking, cycling, snorkelling, and sailing. Shopping is certainly not out of the question, and there are many places where you can buy souvenirs from. In addition to this, renting a jeep is also a good way to explore the island you’re visiting, and there are a few national parks just waiting to be discovered. The Seychelles’ main islands serve as the perfect point of departure for an island hopping holiday. Islands such as Mahé, Praslin, and La Digue offer many excursions to the smaller islands. Tourists have the option of either picking a day excursion, or an extended stay. La Digue is the smallest island of the three, but it offers short trips via ferry daily or on a regular basis to islands such as Grande Soeur or Ille Cocos. Going on such a trip is not a difficult task, and it can easily be arranged with a local travel agency. Ille Cocos houses a marine park where you can enjoy day trips for diving and snorkelling. The second largest island, Praslin, offers trips from five minutes to an hour via ferry or charter plane to islands such as: St. Pierre, Cousine, or Curieuse. By contacting the hotel you are staying at, or a travel agent, you have the opportunity to go on an exciting adventure. The island of Curieuse was once a leper colony, but it is now currently home to a famous tortoise rearing project. Mahé is the largest island, and therefore the one with the most possibilities for island hopping, either by sea or by air. Some of the chartered flights to islands such as Ste. Anne or Silhouette belong to luxury resorts and exclusive hotels, but many arrangements can be made with hotels or travel agents to get to the destination of your choice. The island of Moyenne, which can be reached via ferry, is of particular interest due to its history as a pirate haunt. Tourists can enjoy a one day excursion to Moyenne in order to swim, hike, and go snorkelling. In addition to this, Eco-tourism is a popular activity, and many enthusiasts travel to Bird Island to admire its large population of land tortoises. 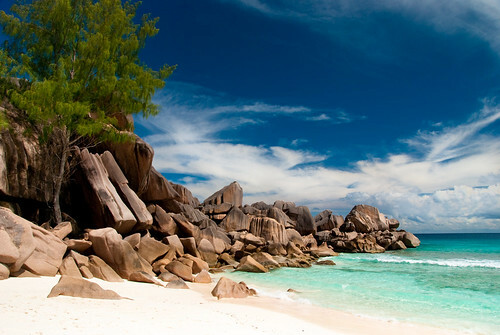 If you’re planning an island hopping holiday, The Seychelles is an excellent choice. Not only does it offer a wide variety of attractions, but it also allows you to choose which islands to visit in a short period of time.